Katniss Everdeen (Jennifer Lawrence) and Gale Hawthorne (Liam Hemsworth) in THE HUNGER GAMES. ©Lionsgate Entertainment. CR: Murray Close. HOLLYWOOD—Josh Hutcherson joins his already arrived “Hunger Games” co-star Liam Hemsworth for an interview in a hotel room, excited and almost out of breath. “He really is,” agrees with Hemsworth with a chuckle. The appearance of their film’s co-star at this hush-hush press junket (to keep overeager fans at bay) isn’t the only reason these young stars are joyful. Their highly anticipated movie, based on the first of Suzanne Collins’ popular “Hunger Games” trilogy of young adult novels, could become a huge worldwide movie franchise and keep them working for the next few years. Nineteen-year-old Hutcherson is a Hollywood veteran, having started in show business at age 9. His movie credits include “Zathura,” “Bridge to Terabithia,” “Journey to the Center of the Earth” and its sequel, “Journey 2: The Mysterious Island,” released in February and now one of this year’s biggest box office hits. Hemsworth is a 22-year-old Australian, who is following in his two older brothers’ (Chris, of “Thor” fame, and Luke, who has starred in several Aussie TV series) acting footsteps. 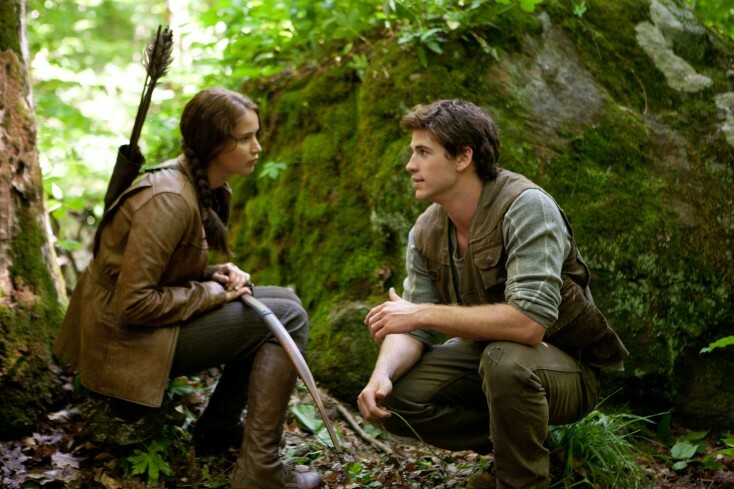 Hemsworth plays Gale, Peeta’s rival for Katniss’ affections. The duo discussed being part of “The Hunger Games,” fame and what’s ahead. Front Row Features: How did you get involved with this movie? Liam Hemsworth: I heard the film was going into production and we read the books. I met with (director) Gary Ross and he was fantastic. I’ve been a fan of him for a long time. I saw Josh at the first reading and we met a few times and then we got called back a week later, and saw each other again. Front Row Features: You changed your looks for your roles? Josh Hutcherson: Yes. We changed hair colors. And he (Hemsworth) had to lose weight and I had to gain weight. We decided it would have a lot easier if we played each other’s roles. Front Row Features: How much did you have to lose and gain? Hutcherson: About 15 pounds each. Hemsworth: He gained about 15 and I lost about 15. Front Row Features: How bummed are you, Liam, that you didn’t get to play the Games? Hemsworth: I have mixed emotions. My character’s against them, but as an actor it would have been fun to be in them. Front Row Features: With the physical stuff, how much of it is acting and how much of it is high-performance competition and how much of it is simply play? Hutcherson: It’s a bit of playing. It’s fun in the training center where they had all the different apparatuses to climb on. That was pretty fun. But honestly, once we were in the Games, it was tough. The weather was one of the hardest elements because it was so hot all the time. We had these jackets that were not conducive to being cool. Front Row Features: What do you think it is about the books that have resonated with the fans? Hemsworth: It’s a lot of things. Any story you put up on screen has to have great characters, and this story has many strong characters. You have characters you care about who are in terrible situations that you want to see them get out of. As I was reading the books, I felt for these characters. This innocent girl has taken a bullet for her sister and is now in these horrible Games. I wanted to see her get out and survive. Hutcherson: Suzanne doesn’t talk down to her audience. She didn’t write a book for kids or for teens. She just wrote a good book. Because of that, it transcends the demographics. Front Row Features: How do you make something so outlandish seem real? Hutcherson: Even though the situations were far-fetched, the emotions they were going through weren’t. Everyone can relate to the idea of having to leave your family or the possibility of going somewhere that you might not be coming back. Front Row Features: When you were younger, did you have any post-apocalyptic movies you liked? Hemsworth: I was a big “Back to the Future” fan. Front Row Features: What surprised you about your co-star, Jennifer, during filming? Hemsworth: She’s completely unpredictable in every way. (She’s) amazing to work with but you never know what she’s going to do or say. Hutcherson: She’s one of those people who doesn’t have much of a filter between what she thinks and what she says. She’s really fun to be around but you never know what she’s going to say. I remember the first conversation I had with her went from catheters to zombies, to the apocalypse to religion. Front Row Features: It raises some interesting questions like could you kill someone if you had to? Hemsworth: It raises some pretty tough questions. Hutcherson: Yeah, the thing I’d possibly kill for is my family. That’s the number one thing. That is sort of what Katness is doing. She’s fighting for her family. Fighting to get back to them. That would be my thing, to do something for my family, to be there for them. Front Row Features: Liam, how about you? Hemsworth: Yeah, there are things. My father has worked for child protection for 22 years; he’s part of the child protection program. I feel strongly about that—children aren’t to be abused; they’re to be protected. Front Row Features: You two didn’t really work together? Hemsworth: We crossed each other’s paths. Front Row Features: You worked with his brother in the upcoming “Red Dawn” remake, right? Front Row Features: Compare the two of them as though Liam wasn’t here. Hutcherson: But he is, so let’s see. Chris and I got along really well on set. We worked together a lot on that so we got really close. Actually, I had Chris over to my house for a few barbecues and his brother came along so I got to hang out with Liam some. They’re both really good guys and really fun to be around and work with. We’re all pretty like-minded and have similar dispositions, so it was very easy for us on the whole. Front Row Features: What else can you tell us about that movie? Hutcherson: It’s a modernized version of the same story. North Korea invades the U.S. and it’s these young adults who band together to fight back something bigger than them, which seems to be kind of the feeling in “The Hunger Games” as well. It’s a rebellion kind of thing, so I’m becoming a rebellious kind of guy. Front Row Features: How do you feel about where you are in your career? Hemsworth: I’m extremely happy to be where I am (in my career) right now. I’m meeting so many great directors at the moment, finding good projects to work on. So I’m in a good place in a sense that I get to choose projects that I’m really passionate about and work with people that I think are interesting who are trying to make things that are interesting and different. Hutcherson: I’m extremely happy with where I am. I’ve wanted to be an actor for 10 years, and to be able to do that is a dream come true.